On 25th of April 2015, a massive earthquake with a magnitude of 7.8 struck the central part of Nepal followed by continuous aftershocks that brought people panic and more fear. During AMDA’s emergency relief missions, Dr.Shegeru Suganami, president of AMDA, had an opportunity to talk about Japanese emergency management on a local Nepalese TV program - Image Channel. His story inspired the TV crews of Image channel and made them think about the roles and responsibilities of mass media during emergency situations. 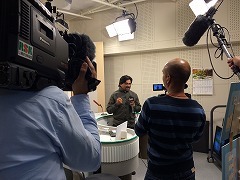 With the great support from Sanyo broadcasting (RSK) in Okayama, Japan, AMDA eventually brought the team of director, a reporter and a camera operator from Image channel to Japan. The aim of their trip is to learn the roles of media members in disasters situations and the efforts of disaster prevention as Mass Media. Nepal is known as a country with high risk for major earthquakes due to its position between Indian plate and Eurasian plate. This time, Nepal’s biggest earthquake in 80 years revealed some major challenges - a response system for disasters, disaster prevention and management, lack of knowledge and preparedness for disasters among Nepalese people. Now that their awareness for disaster prevention has been increased, it is time to educate people in Nepal on emergency prevention and disseminate its knowledge around Nepal to minimize tragedies in the future, which this program aims for. After their arrival in Japan, the Image channel crews participated many different activities from the 16th to 23rd of November 2015 in different cities such as Osaka, Kobe, Iwate and Okayama. 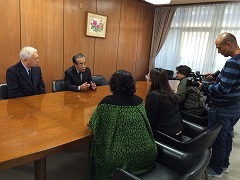 In Osaka and Iwate, they met the reporters and camera operators who immediately rushed to the affected areas of the great Hanshin earthquake and the great east Japan earthquake. The videos of the earthquakes in Japan reminded the Nepalese TV crews of the recent Nepal Earthquake, and made them feel grief over it. 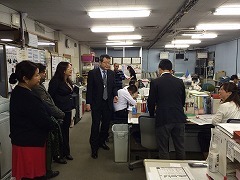 Throughout their visit, they learned that emergency management manuals developed after the calamity of Kobe in 1995 when broadcasting companies in Japan became more aware of the importance of disaster prevention. For example, each member of broadcasting companies has their helmets on for protection in case of disasters. They also have prepared scripts for emergency broadcasting and even the roles of each staff were predetermined for emergency news in advance within the company. For reporting in the disaster affected areas, the media crews bring their portable health management kits as well as their own food supplies. 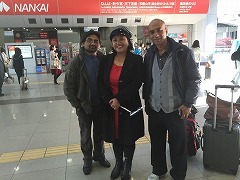 From their visit to Japan, the crew from Nepal also learned about specific things to prepare ahead besides the significance of broadcasting the reality of people in the affected areas to the world, while they protect themselves from the disaster without causing trouble to the affected people. 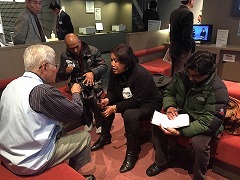 Nepal TV crews able to realize once again the important role of media in broadcasting the event of disasters, after going through Nepal earthquake and visiting Japan for their training.